Bruce Logan’s poignant journey of healing and redemption began during the war years, with two tours of duty to Vietnam as a young infantry lieutenant (1966-67 and 1970-71). Years of fear and loss of friends, loss of innocence, fighting an enemy on their home turf fiercely determined to drive out the Americans. Logan tells the story of those two years in a straight forward, unabashed manner, neither overplaying nor underplaying the war’s horror, always willing to acknowledge his unintended cultural missteps there. In similar spare, non-dramatic style he recounts his struggles with “soldier’s heart,” what is now known as post-traumatic stress syndrome. It is only when his second wife, Canadian Elaine Head, takes up the tale that one begins to see why he needed to return to Vietnam. Indeed, it was at her urging that they join Tours of Peace group to Vietnam in 2006, a year which changed the course of both their lives. They most amazing thing they found there was the overwhelming forgiveness and acceptance given to them wherever they went, be it by former enemies or foes. The gentleness and hospitality they received seemed never-ending, no matter the economic statues of their hosts. Experiencing love where hatred would have been expected, and wanting to give back love and help in return, the two began planning how they would return year after year to bring supplies and encouragement to a country where poverty and official corruption exist despite momentous moves forward, and socialism requires mandatory education of the young at their parents’ expense. Thus they returned with books, pencils, and whatever else they could year after year, dealing with medical crises of their own in the bargain as well as the Vietnamese they came to help. Ultimately, their cycle of love bred yet more love. The book is highly detailed, not only weaving in and out of the war and the lives of its participants, but also of its survivors, their children, and grandchildren as well. The reader is literally taken into the homes of these people and made to experience what they did. Likewise of other Americans who came seeking peace from continued for many to be a horrible recurrent dream. The text is rich with pictures of Logan as a young soldier and later with his wife Elaine and their new Vietnamese friends. The clarity of the photos is superb; their subject matter both warming and heartrending. The appendices at the end, with their timelines and glossaries of military jargon, were most appreciated. This is a wonderful book, which can be helpful to anyone trying to understand the war and most useful to those still trying to get over it. 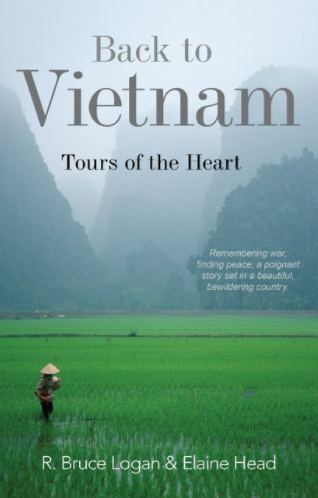 Back to Vietnam: Tours of the Heart, by R. Bruce Logan and Elaine Head is a memoir written in two voices. This literary duet sweeps the reader back through the battle-torn history of beautiful, bewildering Vietnam and across the now recovering nation. Lauded in early reviews, the writing is vividly alive with detail. At times painful passages are softened by the warmth and humor of the writers. The characters who people the pages; frightened young soldiers, forgiving survivors, heroes in wheel chairs, hungry villagers and proud grandmothers become friends to the writers and their readers. Veterans, Boomers, and travelers of all ages will be drawn into the ancient culture and rich folklore of Vietnam. The authors Bruce Logan and Elaine Head, Canadian retirees, have crafted an intriguing tale of their struggles and delights in becoming volunteers in a third world country. They traveled to Vietnam to retrace Bruce’s steps as a young US Army Lieutenant in the 60’s and found their new purpose.